Gestalt is a German word that has no direct translation in English. It encompasses the ideas of pattern and wholeness. In our lives we all search to make meaningful patterns and to find wholeness. The whole is different from the sum of the parts: a whole is where parts come together in a satisfying way that makes sense to an individual. 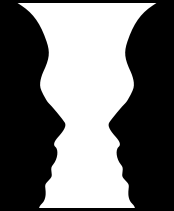 When we look at the well-known faces/vase illusion, we have a simple illustration of how we try to make the best sense we can of a situation, how we try to reconcile the pattern into one whole. We live much of our lives at a subconscious level. For example, we rarely have to think about how to tie our shoelaces or how we speak to someone; we just do what we do. But if we keep tripping over our feet, or having unsatisfying relationships, it may be useful to look at what’s going on. In Gestalt therapy we do this by exploring thoughts, emotions, sensations and actions. We do this in relation to specific problems and with regard to our lives in general. Gestalt therapists are interested in HOW (in what way) people do things rather than WHY; knowing why we do things is often quite interesting, and we usually find this out if it is not already known, but knowing why we do things rarely leads to any changes being made. So Gestalt therapists are interested in HOW people do things: how they try to get what they want, and how they get distracted or interrupted in their quest. When we know HOW something is happening we have an opportunity to make choices we didn’t know we had. In Gestalt therapy, as in some other types of counselling and psychotherapy, we believe that people have a natural tendency towards health, and that they make the best attempts they can towards meeting their own needs. But things get in the way of our ability to live well, to meet our needs and to face the challenges life has for us. Early in our lives we learned ways of being that were the best we could do at the time with the resources that were available to us. Sometimes how we coped then does not serve us well now, but we continue to repeat these patterns because they have become a part of us and are out of our awareness. Additionally, sometimes the experiences we survived cannot be processed and moved on from without support. Gestalt therapists focus on awareness. We aim to do this within a supportive therapeutic relationship. Within such a relationship, it is possible to look at particular problems that are difficult for you, or to explore less tangible feelings of dissatisfaction and unhappiness. This can help you find out more about yourself and what choices you have. If you choose to go into Gestalt therapy/counselling, you will work at your own pace. You will find out more about your emotions, sensations, thoughts and actions, and you will explore how you live in your environment. Gestalt is a holistic therapy based on awareness and relatedness.